Being put on hold is never fun, and for some particularly busy companies that hold time can easily end up being 30-45 minutes of waiting and twiddling your thumbs to talk to whatever representative awaits you on the other end. If you’re lucky, they’ll put on some lame hold music or have some repetitive “we’ll be right with you” line that comes up every few minutes (or unlucky, depending on the tunes) to sort of help pass the time. A better way to pass the time of being put on hold awaits you on the iPhone, and to get through long waits or some incredibly boring phone conversation, you can play your own music or podcast instead, that way you’ll at least be listening to something you chose. Music (or any audio) plays immediately, but instead of outputting through the external speakers, it will be played through the ear speaker. This prevents the music from being piped through to the other end of the phone, and that means the other end will never know you’re jamming to Milli Vanilli to make it through their tortuously boring phone calls and wait times. You can also play streaming music services like Pandora or Last.fm while on a call, but your iPhone will either need to be connected to a wi-fi network or with a service provider that allows simultaneous data and voice transmission, like AT&T. If you want to try this out yourself, call a random 800 number that you’re all but guaranteed to never speak to a human for, like any standard overpriced US internet service provider with bad service. Have fun! Thanks to Tremmel P. for dropping this nice little tip on our Facebook page, don’t forget to like us over there! Is there a way to adjust the volume? Sometimes I like to listen to the music on the background, but I want to be able to hear what they’re saying, so I want the music softer than the phone call volume. How I can adjust the volume on the music so it plays louder? 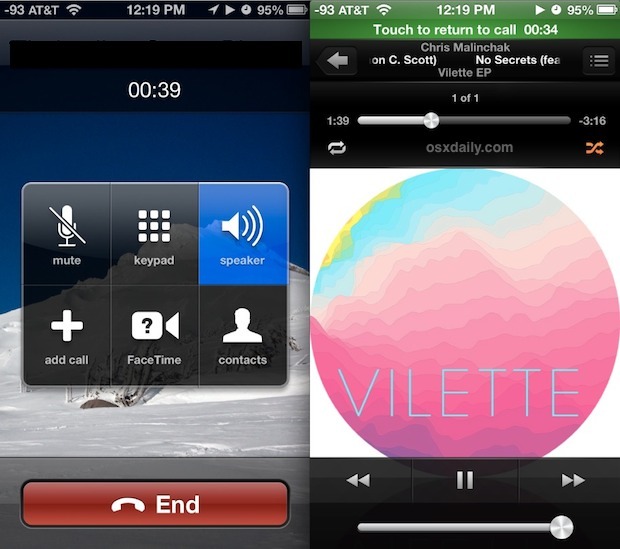 I’m using an iPhone 5 and while on a call and I play music it plays very soft and I can’t hear it. How do I adjust the volume ?